Laminia: The harsh nation of the Goblinoids. Outsiders find the civilization of the Goblins and Hobgoblins to be nowhere near as barbaric and tribal as they might assume. The cities rival human architecture. Food and resources are somewhat scarce. Law is paramount and rather strict, however strength is respected even more. If accused of a crime, you can expect a short, harsh, but not impossible trial, but you always have the option to challenge your accuser to single combat. If you win, then the charges are dropped. Food and resources are somewhat scarce, but still available. There's sort of a class system. The highest class are the Warlords, their captains and generals and other officers. Then there's the slave caste, and finally on the bottom are the commoners. Those unfit to fight that handle the peasantry. Becoming a slave to a powerful house is actually a sought after position. Being a slave guarantees that you get training, a bed, food and pay. The collar you wear that depicts the mercenary house that you are enslaved to commands respect amongst the commoners, and even some among the other houses, as you don't want to harm a valuable slave and potentially make an enemy of another warlord. Being an adult, healthy and able to hold a sword doesn't automatically make you fit for battle. The Warlords require either prior training or natural talent in their slaves, be that martial, magical, stealth or whatever. Goblinoid slaves bear their collars and marks with pride, even though they have no rights when it comes to the house that they are enslaved to, they are free enough to travel, spend their own money and do pretty much whatever they want among the commoners. The slavemarks and collars mark them as elites. And yes, even "pleasure" slaves are well-trained and elite, their beauty is a bonus that makes them even more valuable. The society is mostly patriarichal, but not extremely so. The vast majority of Warlords and their officers are male, but there are some female, and conversely the large majority of the slave caste is female, but male slaves are not rare. A hobgoblin stands 5 feet tall and weighs 160 pounds. +2 Dexterity, +2 Constitution: Hobgoblins are fast and hearty. Darkvision: Hobgoblins can see in the dark up to 60 feet. 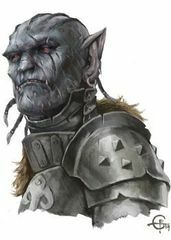 Sneaky: Hobgoblins gain a +4 racial bonus on Stealth checks. Tyrant: Hobgoblins gain a +2 bonus on Diplomacy and Intimidate checks, these skills are always considered class skills. Armor-trained: Hobgoblins are drilled from childhood in the use of armor. They reduce the Armor Check Penalty of all armors by 2, increase the Maximum Dex bonus of all armor by +1 and reduce the Arcane Spell Failure of all armor by 10%. This bonus does not extend to shields and the hobgoblin must be proficient in the armor to gain this benefit. Languages: All hobgoblins begin play speaking Common and Goblin. Hobgoblins with high Intelligence scores can choose any of the following bonus languages: Draconic, Dwarven, Infernal, Giant, Orc.